Blushing brides and grooms planning an upcoming wedding may be looking for ways to put their own unique stamp on the event. These days, there are a whole range of details that can be tailored to personalise your wedding and represent you and your betrothed. From personalised monograms through to unique lighting and photo displays. Find out more about how to make your wedding extra memorable for all the right reasons. 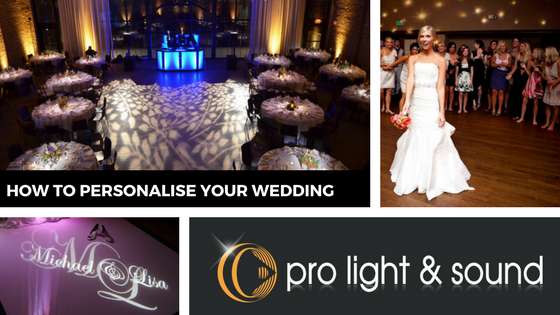 Step your wedding lighting up a notch by adding a personalised logo to the mix. Whether it’s projected onto the dance floor, the entrance way or a feature wall at your venue, guests will be sure to remember your monogram long after the event. This can be made up of your initials or a design of your choice, and can be carried throughout the wedding theme. Feature your logo on your wedding invitations, catering menus and anywhere else you feel like adding a personal touch. You could even consider printing it on napkins and incorporating it into your guests’ favours. Decorate your venue effectively and easily by using a patterned projector to cast a pretty glow across the room. This light system projects a pattern in your chosen colour around the room, and can be directed at ceilings, floors or even walls. It creates texture and sophistication, transforming a plain space into something beautiful, romantic, whimsical and fun. You can choose from a pre-made pattern, whether it’s swirling flowers or a starry design, or create something completely unique to represent you as a couple. You can even choose the movement, rotation and colour of the design, so it’s guaranteed to be perfect for your event. A projector and screen is the perfect addition to your reception and can be used for everything from the best man’s speech through to a slideshow of photos that play throughout the event. Screen home movies, showcase your geeky childhood style or make a heartfelt tribute to each other and project this onto the screen for all your guests to enjoy. Are you planning your dream wedding? Get in touch with a Pro Light & Sound team member and create a very special, personalised wedding to remember forever!